OK. I have an all Rega system, and I am a real fan of the brand. I am thinking of buying a pair of RX5 speakers. Yes or no? I had KEF 105’s forever, sold them a few years ago, and have been using RX1’s and KS50’s off and on. The wife has now approved a new floor standing speaker. So, to Rega or not to Rega???? bhazen and Echoes Myron like this. I have an all-Rega front end in my second system. Currently playing through LS50's but I will be watching this thread for other recommendations for speakers to pair with Rega amplification. I don't know what other criteria factor into this except whether the Rega speakers seem like a good idea. I'd say they are. In this price range, I'd have a couple of other ideas, but I wouldn't rule out just taking a leap of faith on the RX5. Anyone here own the RX5’s? What is the size of the room where they’ll be placed? I own them, for about 2yrs now and very much enjoy them. Originally had them paired with my NAD C356BEE amp, really nice but then I bought a Parasound Halo integrated and the RX5 now sing like crazy. You have to experiment with position from back wall as the side firing woofer is sensitive to that. I have mine out away pretty far and the bass resolution and depth is right for me. When I auditioned them the dealer had them about 4" from the back wall, wayyy too much bass, pulled forward 12" and much better. They are voiced really nice for acoustic and brass, the midrange is super nice and the tweeter is not overly nothing, but nice and sweet. The bass is excellent....I'm not a boom boom hip hop guy. I listen to jazz, prog rock and R&B, vocals are excellent with the RX5s I have the woofers pointed out again you have to experiment with that. I also have them slightly tilted up, again for my listening situation that seems to really expand the staging both wide and deep. My room is about 12x26 and I sit about 10' feet away and more than enough bass. Rockchef, Eric Markowitz, Dolemite and 4 others like this. 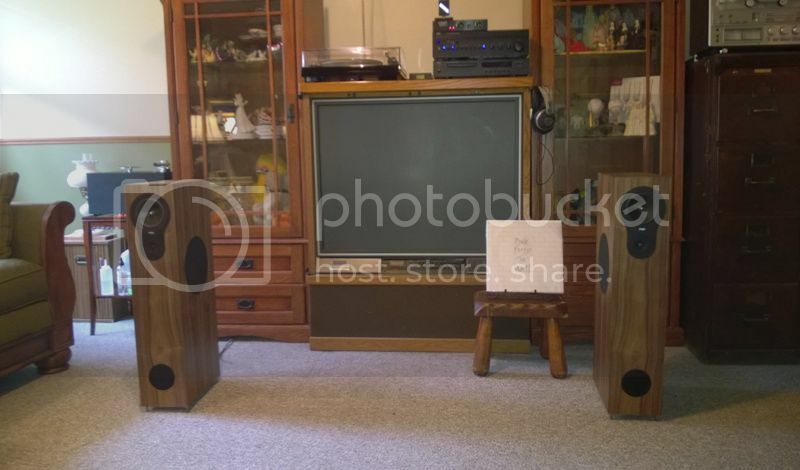 I have RS5’s in a second system, all Rega, except Sutherland Engineering phono stage (link in my signature). I think it performs quite well for the price point. Just for the sake of reference, my room is approximately 13' x 18' with 9' ceilings. The smaller RX3 is more than capable of pressurizing the room while remaining incredibly forgiving of placement without being boomy at all. Initially I auditioned the RX3 in a larger room than my own while at the dealer and they sounded great. But I have a feeling that if my ceilings were vaulted / cathedral style then the RX3's might run out of steam. I'm about to do some serious auditioning of the RX3s and 5s. I have spent some time with the 5s paired with a Planar 6 / Aria / Elicit, and I loved them. Since then I have spoken to a dealer about my room size (18 x 14 x 9) and he has suggested the 3s as they are "more refined" . I'll be spending some time with both later this week. It will be interesting to read about your experience. I have not listened to the RX5 but I'd imagine that each speaker would have a range of room sizes that they would be better suited to. Guth I also notice that our room sizes are virtually identical - Mine"s 16 X 14 X 9 . Love the cosy feel of your room if I recollect it correctly from the relevant thread . Yeah, the photos of my room got lots of the cozy comments over on that thread, lol. With the size of your room in mind I can understand why your dealer might recommend the RX3, at least based on my experiences. Then again, I'm not sure how you would describe your own room from a sonic standpoint. As I mentioned over in the system/room photo thread, my room has some bass nodes that are easily excited by rear-ported designs. (Even after trying things like pulling the speakers a few feet out into the room well beyond where I would simply leave them sitting when not listening.) Fortunately the front-ported RX3's managed to slay that dragon. Good luck with the auditioning. bhazen and Maccaroni like this. Listening last night to Peter Gabriel US (45RPM version) and the track Blood of Eden, the keyboard bass sections are serious, many tracks on that album have deep bass that the RX5s pressurize the room nicely. The bass sounds come at you sub like in that you really don't know where it comes from. A lot of fun.........enjoy the auditioning! I just snagged a nice demo pair of RX5’s. Looking forward to auditioning them..
bhazen, vinylvin, Catcher10 and 1 other person like this. I made it down to the dealer during the week. We started with a comparison between the Planar 3 and Planar 6, both the same Ortofon Bronze cart, plugged into a Brio and RX3s. The 6 won that argument by quite a margin, but that's a topic for some other thread. We then got the RX3s head to head with the 5s. As my records are still in a container going through customs, I quickly picked out and old VG+ ish copy of Obscured by Clouds and a nice copy of A Ghost Is Born - Wot's Uh... The Deal and Muzzle of Bees being my tracks of choice. I thought that those would be representative of the type of music and media I'll be playing. On the Floyd the 3s were lovely. The accoustic guitar was right in the room with me, and the dreamy vocals floated somewhere indistinct above the turntable, just floating . Switch to the 5s , and although the sound was bigge and fuller, no doubt due to the larger enclosures, the elements of the music seemed to separate somewhat, most noticeable in the mid to upper bass. This led me to think that the 3s were more cohesive and natural sounding. Switch to the Wilco and back to the 3s. Surprisingly, there seemed to be something missing - just a little anaemic. Switch to the 5s and it came alive - full, rich and making the hairs on the back of my neck stand up. So where I ended up: settled on a table - Planar 6. Still need to find a dealer where I can put the Exact and the Bronze head to head (this dealer whilst stocking everything else Rega does not like the carts and doesn't stock them) . And then finally to resolve the speaker issue the dealer has offered to let me take both the 3s and then the 5s home once I have a table in place with a run in cart. Dan Steele, Morbius, Blair G. and 1 other person like this. And that’s my kind of dealer. The Analog Room in San Jose for anyone in the SF Bay Area . Sounds like a good auditioning process so far. (I’m quite fond of the P6 as well.) Home-based trials should be even more telling. Good luck! This is my first post and I would like to say hi to everyone. sacsongs, Dan Steele, Eric Markowitz and 3 others like this.